Maintaining a good health pH balance is important for your dog, just as it is important for you. When pH levels get out of hand, this can lead to health issues for your four-legged best friend, especially infections. It is important to find the right kind of dog food that helps ensure that your dog’s pH balance remains stable. A dog with a balance pH is a healthy dog, but also a happier one! Consider some of these dog foods to help with maintaining your dog’s pH balance, or if your dog is experiencing pH imbalance and is experiencing urinary tract problems from it, use these foods to help return things to normal. Your veterinarian may even recommend one of these. 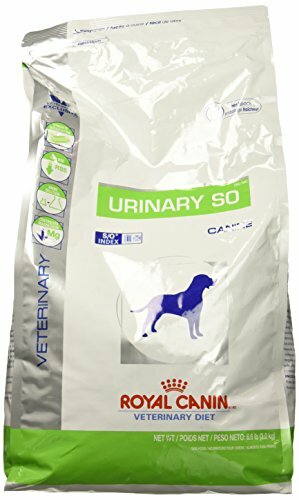 Royal Canin Vet Diet Canine Urinary helps provide your dog with complete nutrition while restoring or maintaining your dog’s urinary health. This is a veterinarian approved formula that’s effective in keeping your dog’s urinary system running smoothly and clean. By controlling the amount of magnesium, protein, and phosphorus in your dog, this dog food prevents the build-up of calcium oxalate and calcium phosphate. 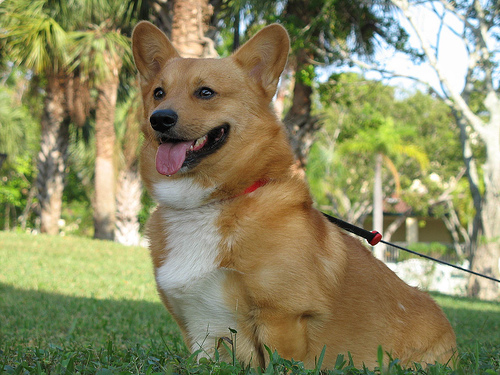 By increasing the acidity of your dog’s urine, it can help prevent kidney stones from forming. Coupled with Omega-3 fatty acids, it also helps fight urinary tract inflammation as well as infections. This is a specialized product and does require valid authorization in order to order this food. This is a prescription-level food, but its efficacy is undoubtedly better than most. It will do the job better than any commercial product you may find just on the shelves in stores. When you don’t want to pull any punches on helping your four-legged companion conquer their urinary tract problems, this is your solution. Consult your veterinarian to fax an authorization form to Royal Canin, and get your bag shipped to you. Also, important to bear in mind is that this only comes in a 6.6lb bag. It is a bit pricey per pound, but it does the job very well. 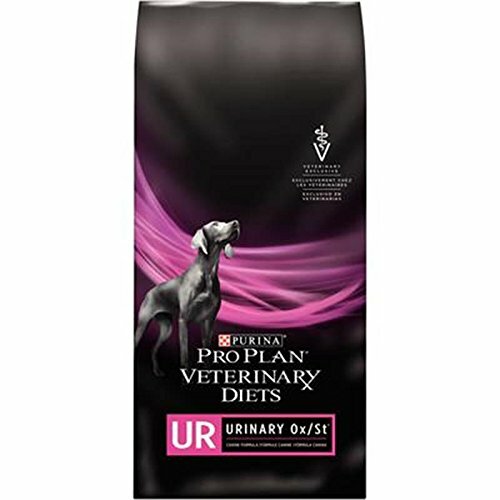 Purina Canine UR Urinary Ox/St is designed for both dogs experiencing urinary tract problems as well as dogs that have had a past history of urinary tract problems. It modifies your dog’s urinary environment and acidity level to help prevent the build-up of struvite and calcium oxalate crystals. Not only does this food work to help promote good urinary tract health and balanced pH levels, but it also contains balanced nutrition for your dog’s general health as well. And you can trust the ingredients because it’s all made in the USA. Ingredients within this dog food include corn, rice, and chicken by-products. It also comes with vitamin and mineral supplements to aid in both nutrition and in promoting your dog’s urinary health. It’s important to note that this product requires a veterinary prescription as well. However, it’s equally important to keep in mind that this particular formula comes in more than just a 6lb bag. You could purchase a larger 16.5lb bag if you wish, giving you more for your money. Hands down, this is one of the best dog foods for pH balance. Hill’s brand has a tradition of putting a lot of science behind their diet formulations and this is no different. This particular formula works to lower calcium and protein levels to help prevent the formation of bladder stones. But there’s more that Hill’s has added to this dog food to better benefit your dog while you’re trying to help your four-legged companion recover from a urinary tract/pH imbalance problem. This dog food also contains antioxidants, designed to help boost your dog’s immune system and prevent urinary tract infections. There’s also taurine and L-carnitine to help maintain your dog’s heart health and circulatory system. This dog food comes in a bigger bag, hence its somewhat pricey tag. However, Hill’s has a reputation of making very effective prescription formulas. 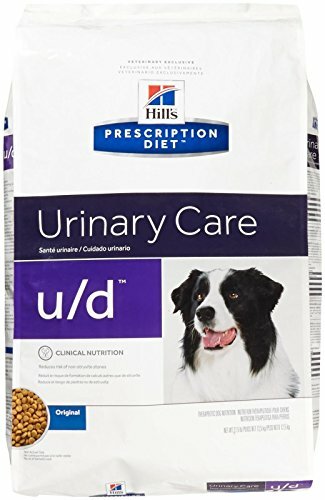 So if you’re looking for a sure way to treat your dog’s urinary health problems and pH imbalances, this is one of the best dog foods around for it. Whether it’s struvite crystals, oxalate, or cysteine, these crystals and uroliths are all signs of problems with your dog’s urinary tract system and pH levels. Aside from causing painful blockages, these crystals can cause damage to the lining of your dog’s urinary tract system, any part of it. That damage can lead to harmful infections, which can lead to even further complications down the road. It is important to watch for your dog’s urinary health. If you notice that your dog is having bloody urine, or is having trouble urinating at all, chances are there is a urinary tract infection occurring, and the cause is likely due to a pH imbalance creating crystals. This also can all affect a dog’s behavior. You may notice that the dog will show large disruptions to their normal urinating routines, he or she may even cry or whimper while trying to urinate due to the pain, and all the while, your dog will not be very happy in between bathroom breaks. By addressing the issue and buying the best dog food for pH balance, you can help prevent these issues from arising, leading to a longer and happier life for your four-legged best friend. Good luck!